For a gentle introduction to radio control flying, rc powered gliders are an ideal answer; their stable and forgiving flight characteristics make them good for beginners to the hobby. But what is a powered glider? Also called a motor glider or e-soarer, this aircraft type is essentially a standard glider design with a motor added. The motor can be in the nose like a conventional plane, behind the wing on a pod, or can be a 'pop up/fold away' motor on a support that folds down into the fuselage when not in use, on top of or just behind the wing. Nose-mounted motors turn a folding propeller, and this is key to reducing drag when the power is switched off. 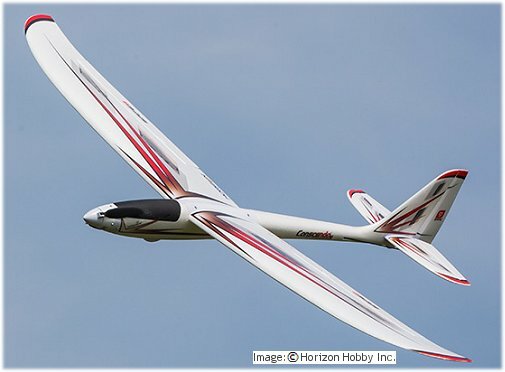 For beginners to the hobby, the Hobbyzone Conscendo is an excellent introduction to powered gliders. With its SAFE™ technology, it's been designed to make learning to fly one of these gentle gliders as easy as possible. SAFE technology gives you two levels of electronic stabilization, or can be deactivated completely. These options, coupled with the inherent stability of the glider, really give the beginner rc pilot a fighting chance of having successful first flights! Moving up in terms of control complexity, the ParkZone Radian Pro, shown below, has been a firm favourite for years. I've had one myself and can certainly recommend them. The Radian Pro has a two meter wingspan, making it a good size powered glider capable of riding the thermals on a warm day. An rc powered glider like this will reward you with very long flight times, with careful use of the power and good soaring skills! The RP isn't particularly a beginner's glider, since it has 'full house' wing features, but it is an excellent powered glider for intermediate pilots. At my soaring club competitions it has, on occasion, outperformed much more expensive rc powered gliders! Moving up in size still, and away from foam construction, we have the popular E-flite Mystique , shown below. 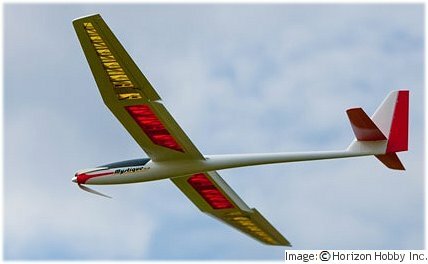 This is a powered glider with glass-fiber moulded fuselage and traditional built-up wings. At 2.9m wingspan it is ideal as a next step up from the foamie aircraft like the Radians, Multiplex Easy Star, Cularis etc. A friend of mine has a Mystique and I sometimes fly it - it's a beautiful flyer and performs exceptionally well on warm thermally days. Again, highly recommended! RC powered gliders are equipped with a folding propeller to reduce drag when the motor is not in use. The blades of the prop are hinged at the root, and when the motor is running the blades are in their normal forward position, thus pulling the glider through the air. But when the motor is shut off, the wind over the blades pushes them back so that they lie flat against the side of the nose of the glider, drastically reducing any unwanted drag while the glider is gliding. Turn the power on again, and the blades flick out to generate thrust once more. Above: the folding propeller blades of an rc powered glider at work: left, the blades in their normal positions when the motor is on, powering the glider through the air. Right, with the motor off the forward motion of the glider through the air pushes the blades back to lie flat against the nose, thus reducing drag. Sometimes folding prop blades might refuse to fold back, and the trick here is to use an ESC with a brake function. If the blades do not fold back as they should, the prop will 'windmill' - turn freely in the air - and this creates a lot of drag, and hence the glide rate of the aircraft will be reduced. An ESC brake will electronically stop the motor from turning, with the Tx stick fully down, and this will allow the prop blades to fold back. RC powered gliders are, more often than not, very gentle birds. They have stable and forgiving flight characteristics, giving you plenty of time to react. But the thing that makes them so attractive is the length of flight times possible; on a good day, flights of an hour might not be uncommon. You hand launch the glider with full power, and use the motor to climb to a good altitude. Once reached, turn the motor off and let the soaring capabilities take over. With a nice steady breeze and good thermals around, the glider will stay aloft for as long as your soaring skills allow. When you've lost altitude, simply turn the motor back on and commence another climb, without landing. Repeating this process means that the motor battery pack won't be drained quickly, and your flight will last and last, so long as you can continue to find any lift that's around. If there are a few of you flying together, why not hold a simple duration competition? All you need to do is launch at the same time and to the same altitude (for example, have a 30-second motor run), switch off the motor and stay up for as long as you can - the last one down wins! It's a great way of enjoying some light-hearted competitive radio control flying with your friends, and it improves your flying skills too! The so-called 'hotliners' are essentially rc powered gliders with extra muscle! Hotliners aren't for beginners because of their speed - you need good reactions and co-ordination, both which take time to develop when learning to fly a radio control plane. Conventional RC powered gliders are, in my opinion, one of the best introductions to powered rc flight available. And they give you the best of both worlds; power when you need it, a glider when you don't! If you're looking for some relaxing and easy radio control flying, a powered glider is without doubt the answer, and in my opinion is one of the nicest type of rc planes to fly.